The leaders of two Catalan independence organisations were jailed on Monday evening by a Spanish high court judge. 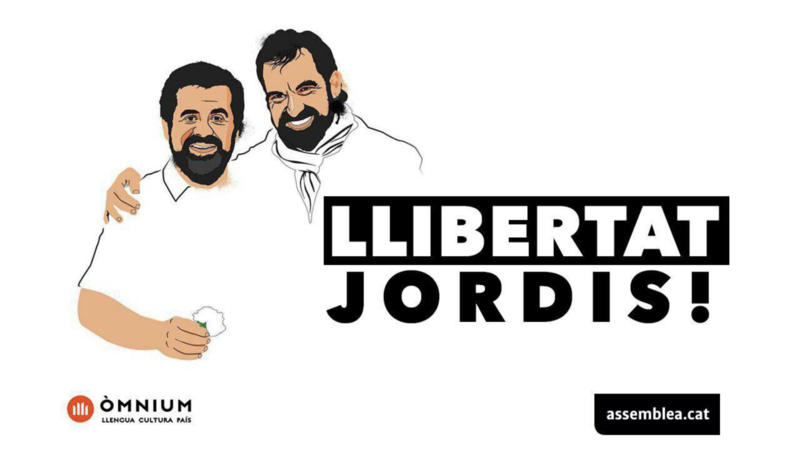 Jordi Sanchez, chairman of the Catalan National Assembly (ANC) and Jordi Cuixart, chairman of Omnium Cultural, are being investigated for sedition. They are said to be the leaders of protests on 20 and 21 September which aimed to stop Spanish police seizing material intended for use in the 1 October Catalan independence referendum. They are being held in custody in advance of trial. Catalan’s president, Carles Puigdemont, called them ‘political prisoners’. The events led to a wave of protests on Monday evening with more planned for Tuesday. ‘Cassoladas’ (banging of pots and pans) took place on Monday night in Barcelona. Catalan firefighters added their voice to the protests. The independence movement called for protests across Catalunya on Tuesday. At midday there will be a general strike with people gathering outside workplaces, and at 8pm candelit protests are planned. Check your local town hall for details of what’s happening nearby. In Tortosa, for example, there will be a protest outside the town hall at midday. In El Perelló there will also be a protest outside the town hall at midday. At 8pm in El Perelló there is a candlelit protest in the main square. At 10pm there will be a cassolada while posters in support of the men’s freedom are hung.